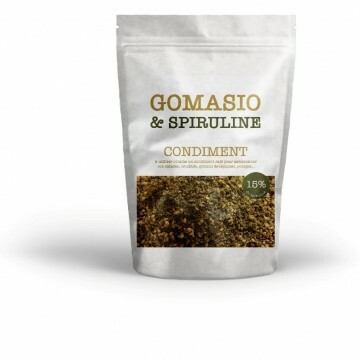 Use gomasio spirulina as a traditional salt. The gomasio spirulina allows season by reducing the amount of salt, while bringing a little nutty flavor to your dishes. It is also rich in unsaturated fatty acids, phosphorous, essential amino acids, trace elements, iron and lecithin. Sesame, on one hand, strengthens the nervous system and neutralizes acidity. Sea ​​salt, on the other, promotes the secretion of digestive juices and boosts metabolism. Spirulina rich in protein, vitamins, minerals and trace elements nourish and tone brings to the organization.